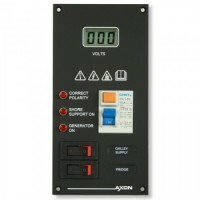 AC control panel with RCBO (residual current circuit breaker with over-current protection). Protects.. Description An AC panel with Carling M series circuit breakers and RCD protection. Fitted w.. The panel is ideal for Marine industry, Horseboxes and Camper vans ● Auxilliary AC M Seri..
Marine RCBO (Residual Current Circuit Breaker with Overload Protection) panel incorporating correct ..
Digital ammeter panel ● Backlit meter● Scale 0-100 amps● 240 volts AC● Fascia in matt-black coa..
Digital voltmeter and ammeter panel ● Backlit meter● Scale 0-300 volts, 0-100 amps● 240 volts A..
Digital voltmeter panel ● Backlit meter● Scale 0-300 volts● 240 volts AC● Fascia in matt-black ..